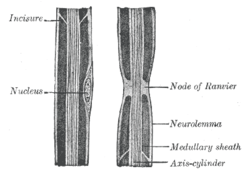 Transverse sections of medullated nerve fibers. Neurolemma (also known as neurilemma or sheath of Schwann (Schwann's Sheath)) is the outermost nucleated cytoplasmic layer of Schwann cells (also called neurolemmocytes) that surrounds the axon of the neuron. It forms the outermost layer of the nerve fiber in the peripheral nervous system. The neurolemma is underlain by the basal lamina (referred to as the medullary sheath in the included illustrations). In the CNS, axons are myelinated by oligodendrocytes, thus lack neurolemma. The myelin sheaths of Oligodendrocytes do not have neurolemma because excess cytoplasm is directed centrally toward the Oligodendrocyte cell body. Neurolemma serves a protective function for peripheral nerve fibers. Damaged nerve fibers may regenerate if the perikaryon is not damaged and the neurolemma remains intact. The neurolemma forms a regeneration tube through which the growing axon reestablishes its original connection. A neurilemoma is a tumor of the neurilemma. ↑ Elaine N. Marieb; Katja Hoehn (2007). Human Anatomy & Physiology (7th Ed.). Pearson. pp. 394–5. ISBN 0-8053-5909-5.